Tensions are rising over the UK’s 50 percent top income tax rate, as the country’s leading analysts weigh in with their opinions on the topic, and the government delays on making any decisions regarding the tax’s lifespan. 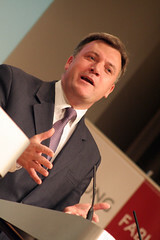 In the latest development on the debate in the UK over the 50 percent income tax rate, on September 8th the Shadow Chancellor of the Exchequer Ed Balls said that cutting the tax should not be a priority for the government, and that supporters of such a move are not being realistic. The Shadow Chancellor maintained that the government should not look to a reduction of the tax. He added that instead, the country would be better served by a significant cut rate of the value added tax. According to current estimates, the 50 percent top income tax rate will raise GBP 12.6 billion over the next five years. The Shadow Chancellor said that the tax should be left to continue to “make billions of pounds”, while the government pursues means to ease the everyday tax burdens of low and middle income families. Ed Balls’ comments came as a response to an open letter to the government from a group of 20 high ranking experts in economics. The letter, which was published on September 7th, called for the government to remove the 50 percent tax rate at the first possible opportunity. The authors claimed that slashing the tax would draw a greater number of investors and skilled workers to the country, and increase the UK’s international competitiveness.